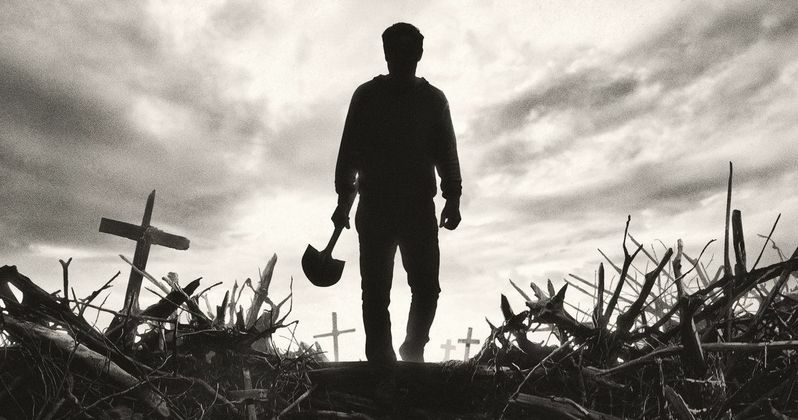 The first poster for the Pet Sematary remake has been revealed. Paramount Pictures dropped the poster online today and have promised that the first trailer for the Stephen King adaptation will arrive tomorrow. It's been an absolutely excellent time, not just for horror fans, but for King fans specifically over the past year or so. Will this remake continue the positive trend? It's a bit early to say, but this first poster is certainly on brand and looks to be what one would hope for when it comes to a Pet Sematary movie. The poster is very stark, mostly gray, with shades of black and white. We see the silhouette of Louis Creed, shovel in hand, standing above an absolutely haunting wasteland of the dead. The only thing blessed with any color is the title, which is bathed in blood red at the bottom. The one-sheet also comes with the hauntingly familiar tagline, "Sometimes dead is better," which hints at the tragic and horrific events that will be unfolding on the big screen next year. Pet Sematary centers on Dr. Louis Creed (Jason Clarke) who relocates his wife Rachel (Amy Seimetz) and their two young children from Boston to rural Maine, which represents a pretty dramatic shift in lifestyle for them. After their arrival, Louis discovers a mysterious burial ground hidden deep in the woods near their new home. When an unexpected tragedy strikes their family, Louis turns to his unusual neighbor, Jud Crandall (John Lithgow), for help, which sets off a dangerous chain of events that unleashes a terrible evil with horrific consequences. Sometimes dead is better indeed. Stephen King's novel was adapted previously in 1989 and, while that particular movie has its fans, it would likely be hard for many to say that it lives up to modern horror standards. Though, it did spawn a sequel that was released in 1992. This new take is helmed by Dennis Widmyer and Kevin Kolsch, known best for their indie horror hit Starry Eyes. This project comes in the wake of IT, which wound up being a massive hit last year and has made King properties a very hot commodity in Hollywood. Paramount wasted no time in giving the green light to this project and made quick work of getting it in front of cameras. The studio recently released the first batch of photos from the movie, including the infamous cat Church, who we'll surely be getting a look at in the trailer tomorrow. Pet Sematary is set to arrive in theaters on April 5, 2019, where it will be going up against some stiff competition in the form of the DC superhero flick, Shazam. We'll be sure to bring you the trailer as soon as it's made available tomorrow, so be sure to check back with us for that. In the meantime, take a look at the new poster from the Pet Sematary Twitter account for yourself below.